New era for the West Coast Mainline as government confirms future operator will also run HS2 services. The government today (4 November 2016) announced a new rail franchise which will combine the current InterCity West Coast services with the development and introduction of High Speed 2 services. The franchise, which will run for the first 3 to 5 years of operation of HS2, is the first step in attracting a world-class bidding group to develop and enhance the service for West Coast passengers and pave the way for the introduction of HS2 services in the future. We are embarking on a new chapter in our modernisation of the railways and we need world-class expertise to deliver it. HS2, Britain’s new railway, will reduce crowding on the existing network and generate economic growth up and down the country. 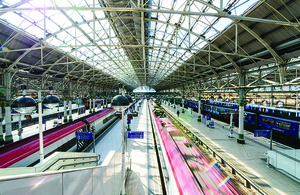 Phase One, due to open in 2026, will see trains travel at high speed between London and Birmingham before running on from Birmingham on the existing West Coast Main Line, setting a new benchmark in passenger experience along this route. Today’s announcement is just the first step.The formal expression of interest (EoI) for the West Coast Partnership is due to be published in December 2016, followed by the invitation to tender (ITT) in October or November 2017, with the new franchise scheduled to start 1 April 2019.